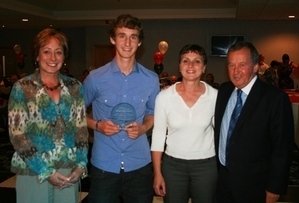 Rainford Tennis Club have won Club of the Year at the 2009 Lancashire Tennis Awards. The Club won the award following an online vote having been nominated for their excellence during 2009. Since achieving Tennis Clubmark in January, the Club have significantly increased the number of juniors attending coaching and competitions and have doubled the number of members at the Club. In addition, they have delivered tennis to thousands of children in local primary and secondary schools. Our picture shows Helen Bligh (Chairperson), Chris Pettet (Junior Representative) and Linda Collins (Treasurer) receiving the award from the LTA President, Derek Howarth at the Lancashire Tennis Presentation Evening, which took place at the Reebok Stadium in Bolton.